Journal: I got up at 6:00am after a reasonable night's sleep. It was cold with some wind but partly sunny. I packed up and left at about 7:20am, walking up the first long hill. I felt positive about getting to Omeo for lunch and maybe getting back on schedule. Past the first hill I began riding and managed to ride up most remaining hills for the day. I was keen to cover ground and rode as much as I could. After an hour I reached Grassy Knob Track junction which meant I was about 10km short of where I thought I was last night. A bit demoralising. I continued on making reasonable time but then, when I expected to start descending, found myself steadily ascending most of the time. I kept pedalling but was getting very tired, although the alpine views were great. Eventually the long descent came, but it was rocky and often corrugated and I had to steer very carefully. I passed a hiker and shortly after got a puncture in my rear tyre. I couldn't find hole in the tube so changed the tube, successfully, although, all up, it cost me about 45 minutes. I continued on with the quality of the road steadily improving but still plenty of uphills. Getting closer to Benambra I realised I was getting very tired, probably the result of the last two or three very physically tough days. I decided to have lunch in Benambra and think about stopping early in Omeo to allow some recovery. Benambra was smaller than I anticipated but there was a general store/cafe and I had a burger for lunch. 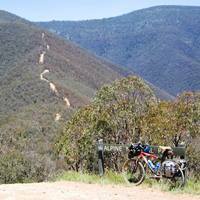 It took a long time to prepare and I didn't leave until 2:00pm for the 22km ride to Omeo. It was getting quite warm riding across the open pastureland and then I encountered yet another large hill (I was hoping it was going to be all downhill to Omeo). At the top were great views to Omeo and then a fantastic long and fast descent followed by a few short sharp hills to Omeo. I found a nice motel in the main street and did some shopping before having a counter tea at a nearby hotel.